Hobbies? Singing, reading, hiking, tennis, cycling, cooking, piano, crocheting, swimming, dancing, enjoying classic films and TV shows, as well as studying World War II and the Latin language. What's your favorite class? Reconquista and Crusade with Prof. McGuire. He is so animated and enthused about the subject, it's difficult not to like the class! Do you play any sports? Not on the varsity level, but I'll play tennis, walleyball, volleyball and softball. Do you participate in any drama or music related activities? Currently my closest connection to drama is serving at the upcoming Mystery Dinner Theater. In the past I have been in the College's productions of "Seven Brides for Seven Brothers," "The Apollo of Belloc," and several other skits. 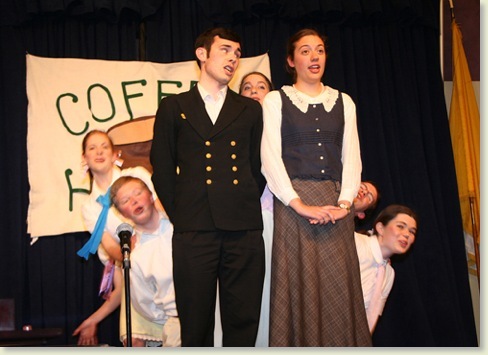 I also sang in Dr. Clark's choir. What is your favorite thing about Christendom? I love the faculty, but the best thing has been having the chapel right there, where Our Lord is always waiting for you. Why did you choose Christendom? I chose Christendom because I wanted a solid Catholic Liberal Arts education and a degree in History. What do you plan to do after graduation? I plan to head back west and work as an event planner or editor. 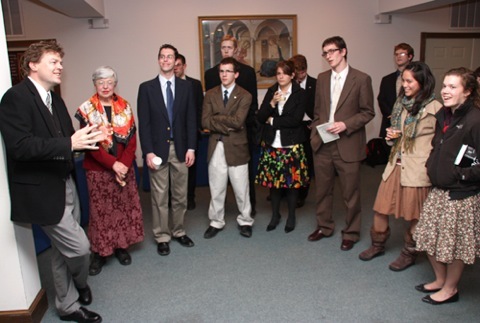 Last Thrusday professional artist Henry Wingate gave an address on his experience as a Catholic artist to students at the opening of a Student Art Exhibit, being held in St. John the Evangelist Library. 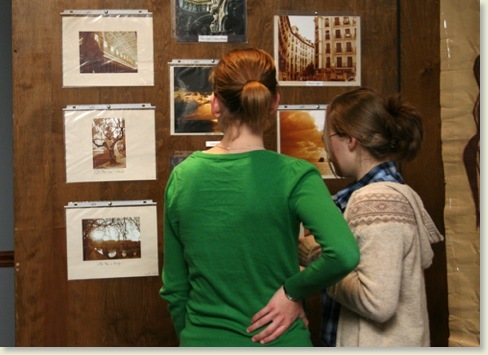 The exhibit featured sketches, photos, oil paintings, and water colors all by Christendom's talented students. 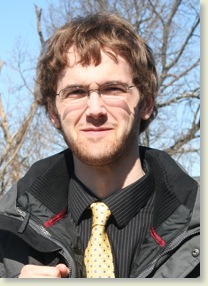 Henry Wingate's address will be available for download at Christendom on iTunes U. Senior Mary Erwin and John McWhirter check out a series of portraits. 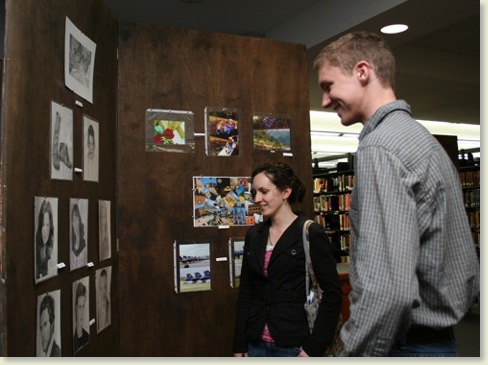 Sophomore Katie Gutchke discusses art with Wingate at a reception following his address. Student enjoyed seeing the talent of their peers on display. 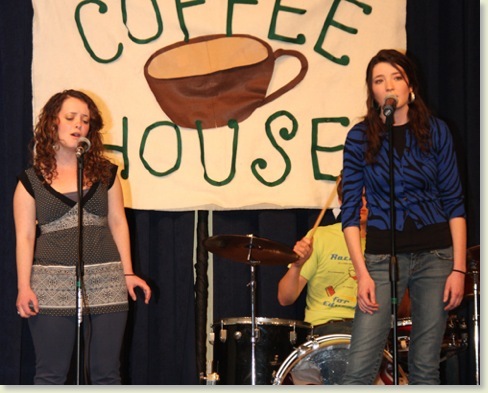 Live from Front Royal—it's Coffee House 2010! Saturday night, the commons was packed with excited audience members, waiting to be wowed once more by the talent and creativity found at Christendom. 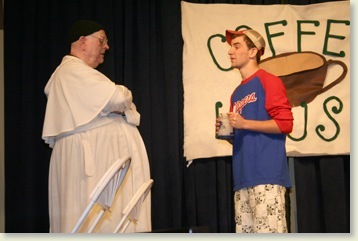 This year’s Coffee House started with a humorous “un-morality play” jesting about ways to “get around” Christendom’s rules, followed by an amusing entrance, and introduction to the show by Christendom’s own Fr. William. The evening was hosted by Senior Nathan Gneiwick, who as usual kept the audience amused, and didn’t miss a beat with his quick wit and hilarious impressions. Perhaps the funniest skit of the night was organized by Junior Theresa Boak, who got together a group to reenact a skit first seen on Saturday Night Live. 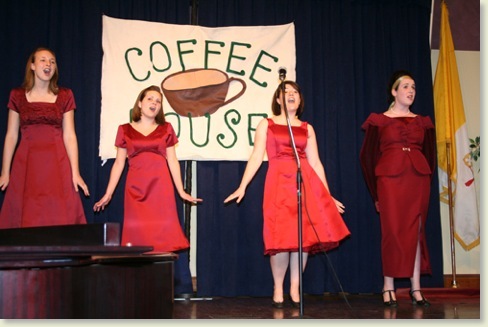 The skit, which poked fun at "The Lawrence Welk Show," was indescribably funny, and hilariously performed by Juniors Theresa, Nick Freeman, Daina Lamirande, Janie Wells, and Senior Monica Clarke and Sophomore Dan Beller. Sophomore Meghan Kelly did her part to keep the amusement going by singing the clever song, “Apartment 14G”, accompanied on the piano by Sophomore Rob Fetsko. The song is about a girl who moves into an apartment, only to find that below her lives an exuberant opera singer, and above her an enthusiastic skat singer. 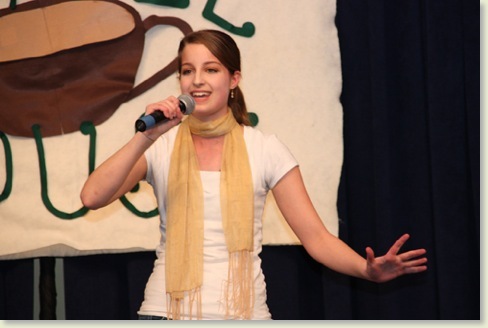 Freshmen and Sophomore’s performed “The Sound of Music in Five Minutes” starring Freshman Rachel Kujawa. 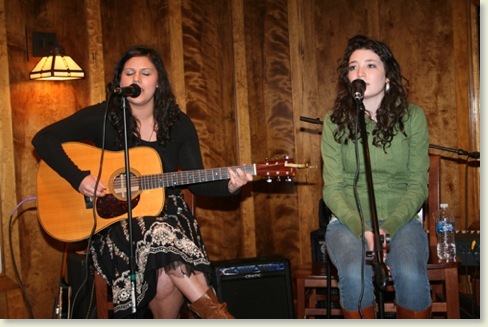 Freshman Colleen Harmon and Theresa Lambert sang Corinne Bailey Rae's "Put Your Records On." 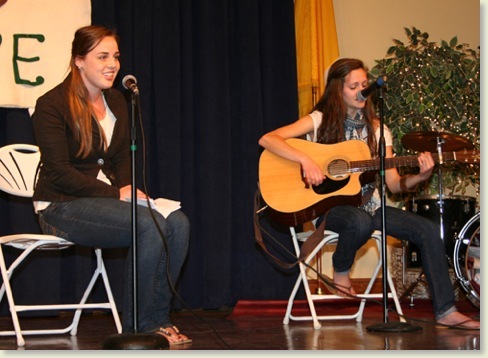 Seniors Meghan Rubin an Shelagh Bolger sang "Two Is Better Than One." 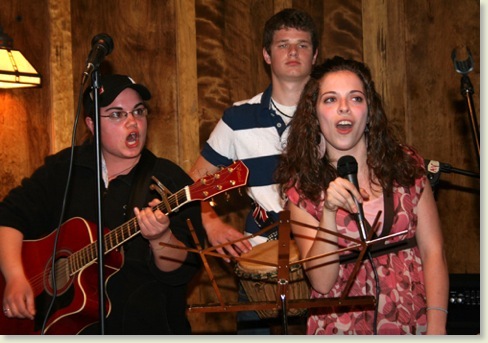 Freshman Gabe Schuberg played bass, Freshman Dominic Ginski played drums, and Junior Catherine Briggs played the guitar. Check out our new 30 second TV spot. Let us know what you think! 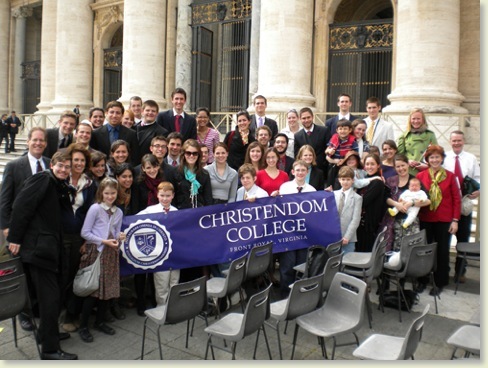 On Tuesday, March 23rd, a new breath of Christendom College arrived in Italy, when Dr. and Mrs. O’Donnell and their sons—Conor, Kieran, and Declan—came for their annual semester visit. The O’Donnell's were also joined by Professor Mark Clark and his family. My classmates and I were delighted to see them all and were reminded that although the distance is great, the Christendom and Rome campuses are connected. Although he just arrived that morning, jet lag did not deter our college president from leading us on a massive tour of St. Peters. Together we explored the basilica, as Dr. O’Donnell gave us a two hour story time of the statues, side alters, and paintings of St. Peters. As we listened, I realized again how amazingly universal the Catholic Church is, the home of saints and sinners alike. The tour ended with a stop at the altar of Pope St. Pius X, where Dr. O’Donnell led us in prayer for the faculty, staff, students, and benefactors of Christendom College. Dr. O’Donnell picked that particular alter because St. Pius's moto is shared by Christendom College: “To Restore All Things in Christ”. The next day we gathered together again for a Papal audience, no small event. Although my classmates and I had to get up very early, we knew that seeing and hearing our beloved pontiff was worth any lost sleep. As soon as we were announced, the Christendom students went wild and cried “Amamus Te”. Pope Benedict smiled and waved at us, which only made us cheer louder. Later, as the audience drew to an end, the pope drove very close to where the Christendom group sat. Although none of us were able to shake the pontiff’s hand, we were able to witness how Benedict’s eyes lit up when he saw the Fuerte baby, a beautiful sight to see. Afterwards, we had luncheon with Cardinal Arinze, where his eminence honored us with not only his presence, but his wonderful sense of humor as well. 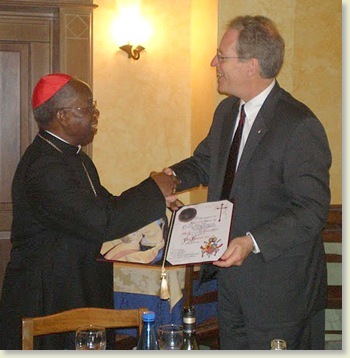 At the close of the meal, Dr. O’Donnell presented Cardinal Arinze with Christendom College’s spiritual bouquet for Pope Benedict XVI, which his Eminence was to give to the Pope on Palm Sunday. 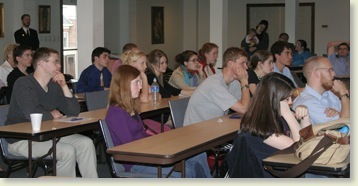 Later that evening we all attended a talk given by our own Dr. Clark, titled “On the Annunciation”. Once the Papal audience was behind us, my classmates and I were very grateful to enjoy a relaxing night walk along the Tiber with the O’Donnells. Although a couple boys insisted on teasing the girls to be on the outlook for giant rats, our river walk was very peaceful and uneventful. Our busy week ended with a grand tour of the Vatican Museum followed by visit to the papal gardens. Although the Museum's religious artwork by the likes of Michelangelo and Raphael were amazing to see, we were happy to leave the big crowds behind and enjoy the quiet of the Vatican gardens. Now as the O’Donnell's return to the states, the Rome students are catching up on sleep and gearing up for Holy Week and Easter Sunday in St. Peters itself. 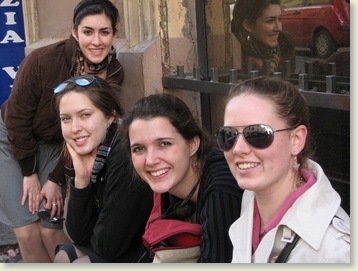 Christendom in Rome: smiling faces after seeing Pope Benedict XVI. 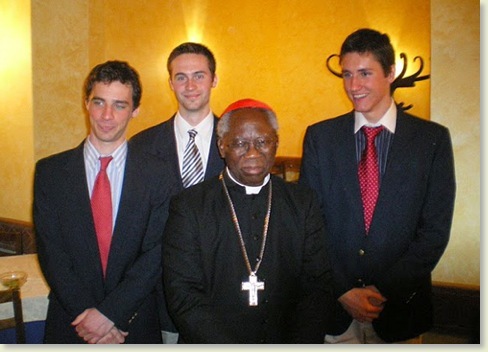 Joseph Ruhl, Joe Townsend, and Francis Aul snap a photo with Cardinal Arinze. 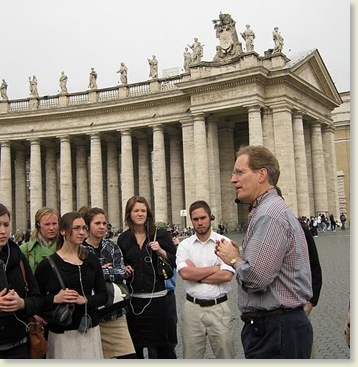 Dr. Clark guest lectures in Rome. 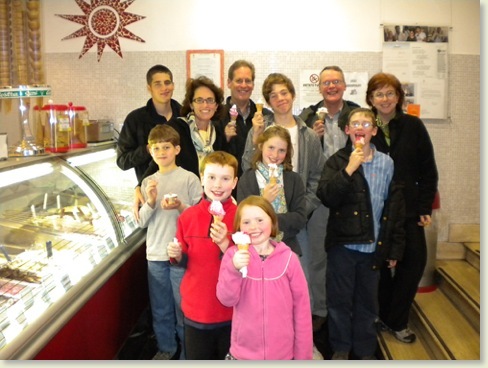 The Clark's and O'Donnell's enjoy some amazing gelato. 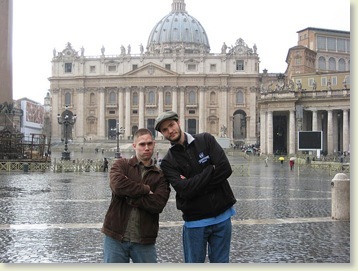 Chillin' in the Pope's backyard. Liz: So how did you get started writing for more professional sites, and did your experience writing for The Chronicler Online help or contribute to your experience at all? 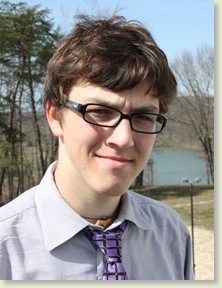 Jack: Actually Christendom gave me a great opportunity to get my feet wet in the world of journalism. Working with The Chronicler gave me an idea of how to interview people and cover sporting events while making deadlines each week. Eventually I started branching out to the Internet where there are quite a few open source sports websites that anyone can join. Liz: What is it specifically that you do? Jack: I have done a number of different things over the past two years in sports journalism. 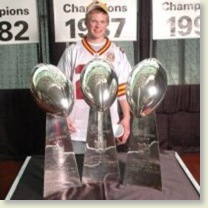 I have been able to start my own blog covering the NFL's Washington Redskins while writing for several other sites around the web. Last year I was lucky enough to obtain media credentials for every Redskins home game, meaning I attended each game in the press box and received full access to the players and coaches for interviews after the games. It was an exhilarating experience which confirmed my desire to work in sports media. Liz: Have you always been interested in sports journalism? Jack: I have always been interested in sports in general. I love competition and watching others compete on a high level. So after I realized I wouldn't ever be a professional athlete, I settled into my niche with writing. Liz: What are your plans for the future; do you plan on diving further into this particular field? 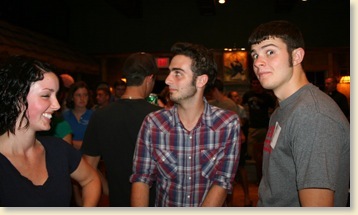 Jack: Well I am trying to land a job with XM radio over the summer through Christendom's Internship Program. I am very interested in sports radio and broadcasting. Sports media is such a wide field that I haven't honed into what I could be best at. However, I do know that I will be in a sports-related field after I graduate. Liz: What would you say to others looking to get involved in something similar? Jack: Market yourself and be assertive. Get your name out there through writing on an open source website and with Facebook and Twitter. I started with no contacts two years ago and now I have several colleagues working with big companies. It's all about networking. Liz: How/would you say that Christendom has helped you in this area? Jack: Christendom has helped me with networking. Dr. Way from the Political Science department really pushes us to be friendly and work into different groups of people. All you have to do is take a deep breath and introduce yourself. If you make a good impression, it can go a long way towards making your career. 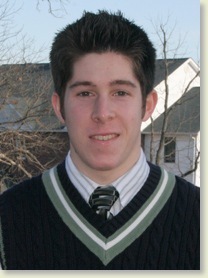 Read Jack's work at the NFL's Blog Blitz, NFL Touchdown, or his own blog skinstalk.com. The Crusader’s baseball team despite having no wins to show for their season to-date is on the right track and has succeeded in completely turning around a program that was ready to shut down. With 4 games under their belt all of which were close until late into the game, the Crusaders are looking forward to starting a new winning tradition here at Christendom very soon. Coach Mercandetti in his 2nd season has a great group of guys anxious and ready to play their next game. The team, consisting of 18 players which is an all-time high in recent memory boasts 12 underclassmen of which 9 are freshmen. At one point during their last game against Valley Forge Christian College the entire infield was made up of underclassmen, this gives great hope and promise for the program. The team is led by the senior leadership of Ryan Doughty and TJ Nacey; TJ has been a 4 year starter and the last 2 years has been the number 1 pitcher for the team. Dan Mitchell, a freshman transfer, has solidified the Crusader infield by his skill and consistency at shortstop and is adding his two-cents from the mound also. In fact Dan had a perfect game going into the 5th inning this past weekend against Valley Forge before Valley Forge broke loose for 3 runs. 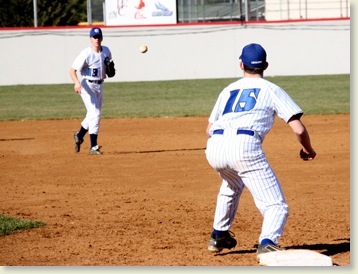 The team started off against Baptist Bible College on March 18th, only 10 days after the snow had melted! After a few rusty innings the Crusaders settled down and showed the fans that they will have plenty to cheer for, both this year and in the future. The Crusaders fell to Baptist Bible in both games, but, having practiced on a field only once prior to the game, Coach Mercandetti and the team could only be positive. 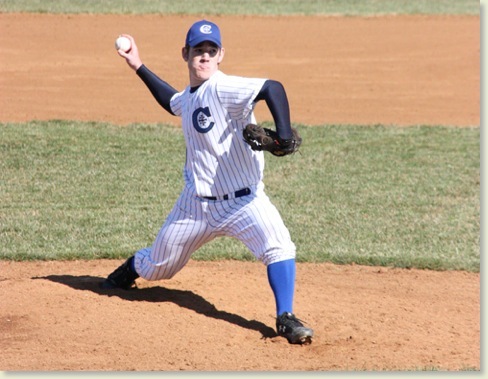 The 2nd outing was this past Saturday where the Crusaders took on the Valley Forge Christian Patriots. Playing on a small field that hampered the Crusaders defensively, the Patriots would win 7-4, however the Patriots committed more errors than the sure-handed Crusaders, but would also hit more home runs which told the story of the game. 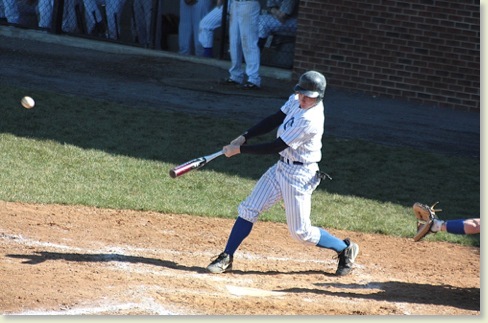 In the 2nd game Dan Mitchell pitched a perfect game into the 5th inning and the Crusaders clung to a 1-0 run lead: Valley Forge would strike with more home runs and pull out a 7-1 victory despite the great defensive effort from the team. Despite the 4 losses, the Crusaders are in good spirits and are thinking positively and looking forward to their next outing against Williamson Free Trade on April 10th. Crusader baseball is most definitely back and from the looks of it, back to stay! 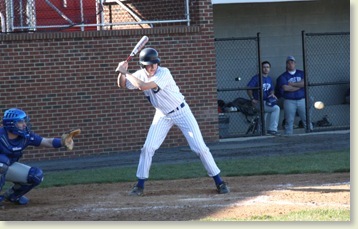 Senior TJ Nacey prepares to let a fastball fly. 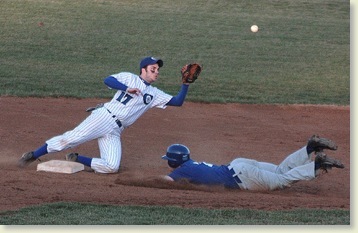 Sophomore Pat Stein sends one to the outfield. A. You’ve heard correctly! We are experiencing our best recruiting year yet, thanks be to God! We are on track to bring in about 125-130 students this year. Last year was a little rough but we did end up meeting our enrollment goals for the year, while still maintaining our normal standards of admission. 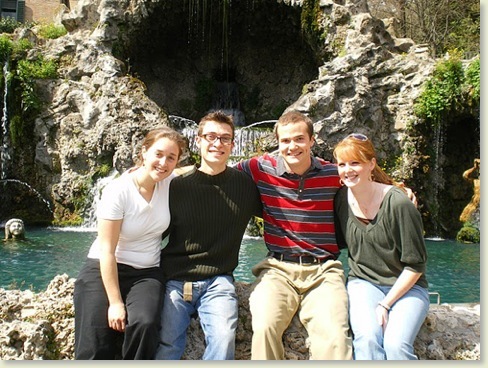 Christendom’s Admissions Committee sets the standards for incoming students to be accepted. Basically, there is an expectation that the incoming student will have scored at least a 1650 (three sections combined) on the SAT or a 24 on the ACT. The Committee does make exceptions to these standardized test scores, but this is their standard expectation. Also, students should have a minimum of a 3.0 GPA, two letters of recommendation, and well-written, grammatically correct essays. 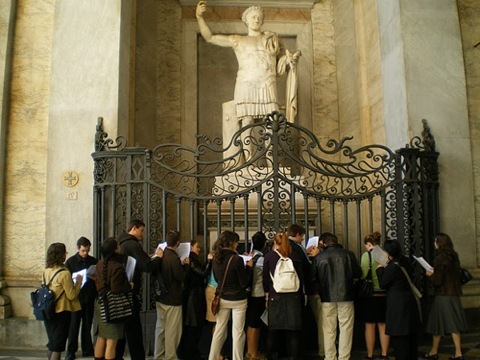 17% say they wish to major in Theology, 9% want Political Science, 15% choose History, 19% select Philosophy, 3% are hoping for Classics, and 37% are leaning toward English Language and Literature. They will not have to select a major until the end of their Sophomore year. 24% of them applied only to Christendom…they were that committed! Hobbies? Sports and playing guitar. What's your favorite class? Freshman Theology with Fr. Gee. All of his classes are excellent and entertaining. He really makes everything clear and helps us to understand what he's teaching, through the use of real life examples rather than just a lecture on the material. Do you play any sports? 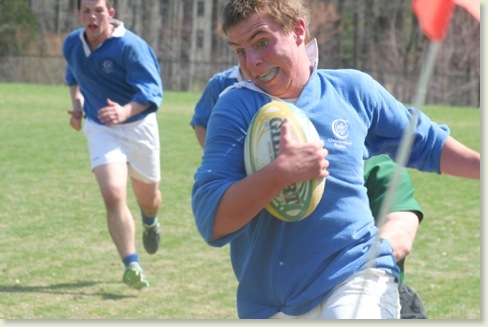 I play rugby. I love how it, is entirely about the team working together, which is a little different from other sports. It's a brutal sport, but the camaraderie and unity of the team is incredible. What is your favorite thing about Christendom? I love the community. The fact that the college is small gives you the opportunity to build amazing friendships with so many people. It's like one big family here. Why did you choose Christendom? I went to the summer program. At first I had no interest in attending, but then I was amazed at how incredible the people were and how the classes and student life were totally Catholic, unlike any other college. What do you plan to do after graduation? No serious plans as of yet. I am considering going into finance. 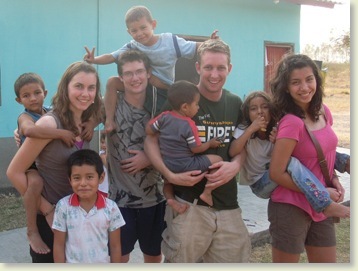 Two groups of students went on missionary trips to Honduras and the Dominican Republic for their spring break. The group in the Dominican Republic built outhouses for four villages. The group in Honduras worked in banana fields and aided an orphanage in instructing children in English and leading recreational activities. Check out the Honduras Mission's blog and read about how the students made a difference as well as Sophomore Elizabeth Twaddles's reflections on her trip. students at last Monday. His talk, entitled “To Hell and Back: Catholicism, Liberal Arts, and Business Ethics,” explained how the wisdom and ethics of the Catholic intellectual tradition has the ability to shape the future of business for the better. “Whether you’re Catholic or not, the Catholic intellectual tradition provides us with a framework for understanding the complexities of the world and helps us stand up to today’s chaos-filled environment,” he said. Voss is the President of Ethikos, an ethics consulting group, and an Associate Professor at Georgia State University. 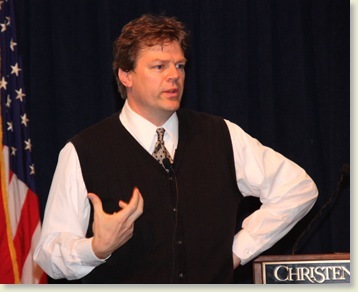 A gifted public speaker and award-winning teacher, his clients include the FBI Labs, General Electric Energy, British Petroleum, the Home Depot, Visa, the Federal Railroad Administration, and many others. Voss explained that the current recession is not, as some people are claiming, the result of increased greed. He said that the recession was the result of a culture, which lacked ethics and wisdom. Read more about this talk here. Download it at Christendom on iTunes U. 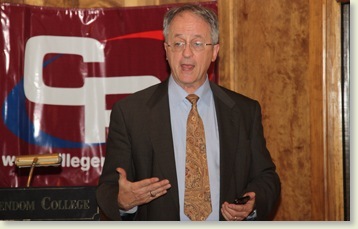 Student enjoyed discussing the current business ethics crisis with Voss at reception held after his address. 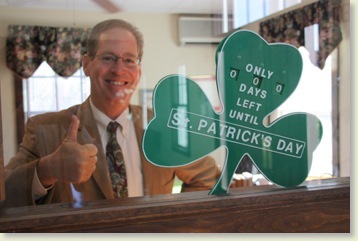 It finally arrived - the day our President Dr. Timothy O’Donnell had been waiting for for so long - St. Patrick’s Day. The St. Lawrence Commons was a sea of green on Wednesday evening (March 17th) as students gathered for an Irish themed dinner, featuring salmon, beef braised in Guinness, and some amazing scones. After dinner, everyone gathered back inside the Commons to enjoy the great lineup of performances. The night was kicked off with the blessing from “St. 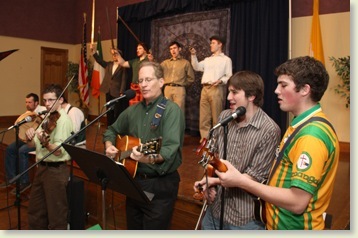 Patrick,” and moved onto music from “The Clansmen," a musical group comprised of Mrs. Sofia Cuddeback, Sophomore Brian Killackey, Juniors Nick Freeman, Rory O’Donnell, and Ben Raneri, and Senior Zach Miller, accompanied by Dr. O'Donnell on guitar. The evening moved on to a large assortment of Celtic dancing and music. The audience had a great time at the festivities, and is happy that Christendom is able to celebrate the different cultures of its students in such a high-spirited way. 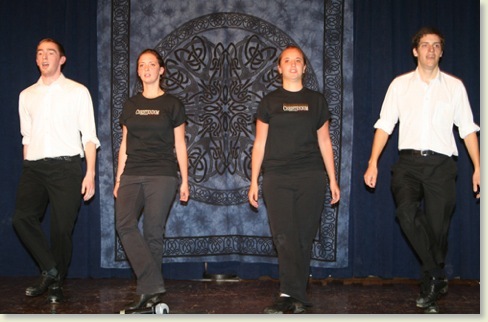 The Boyle School of Irish Dance was lead by Sophomore Chris Foeckler. 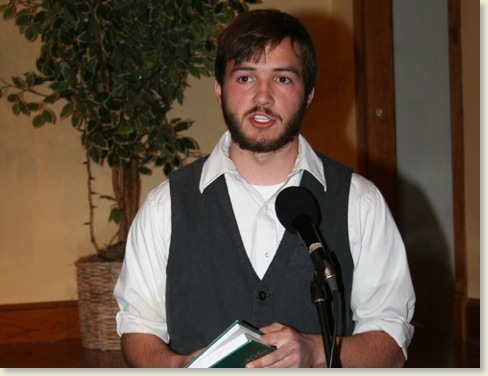 A poetry reading was given by Freshman Thomas Daily. 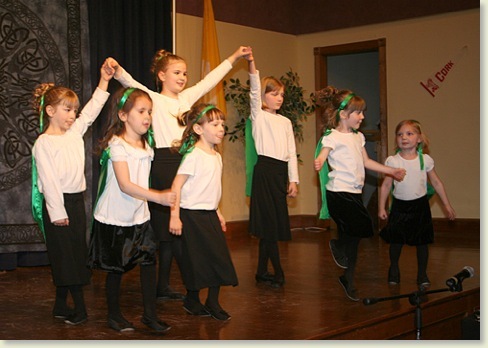 Local children's Irish dancing troupe, The O'Kielty Dancers, delighted the audience. 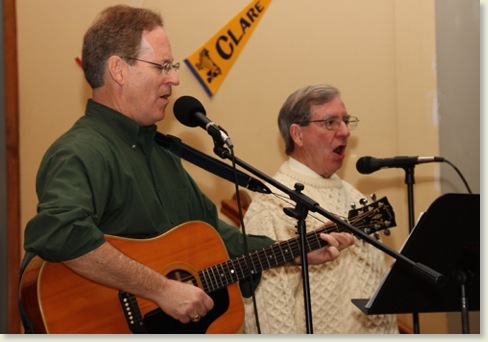 Theology Professor Raymund O'Herron joined Dr. O'Donnell for a number of ballads. 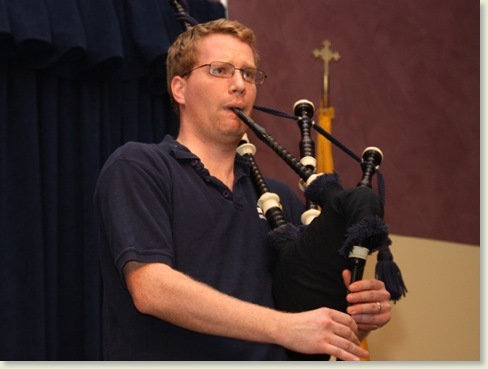 History Professor Brendan McGuire gave rousing performance on the pipes. The Francis Sisters: Liz and Katie. 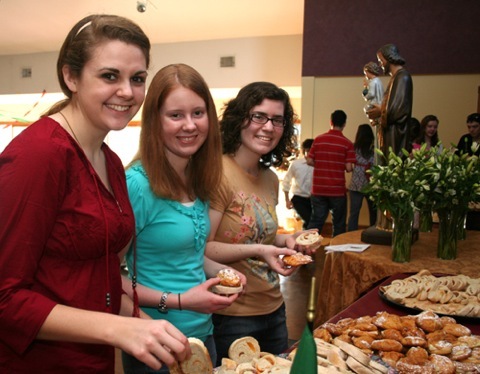 On Friday, March 19, la festa di San Giuseppe was joyously celebrated by Christendom students and faculty. 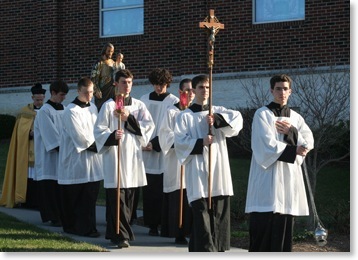 The festivities began with Solemn Vespers, followed by a procession of the statue of St. Joseph to St. Lawrence Commons. After a beautiful prayer to St. Joseph, Chaplain Fr. Daniel Gee gave the traditional blessing of the bread. 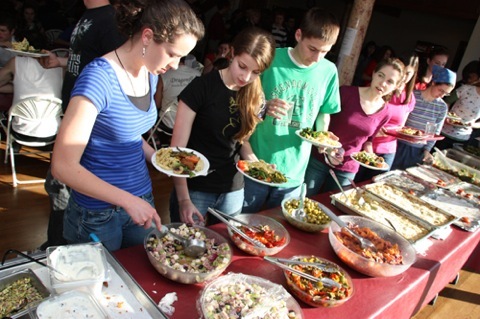 Students enjoyed a large Italian meal prepared by Christendom students, under the leadership of Senior and enthusiastic Italian, Katie Carducci, and Assistant Director of Admissions Michael Schmittino. St. Joseph is known as the patron saint of workers, foster fathers, happy deaths, husbands, the universal Church, dedicated souls, and the unborn. Fr. Gee leads everyone in prayer before the feasting begins. Schmittino's famous Calabrese Bread as well as Special St. Joseph cream puffs pleased everyone's palate. Italian students whipped up a rainbow of amazing antipastos—many of them family recipes. 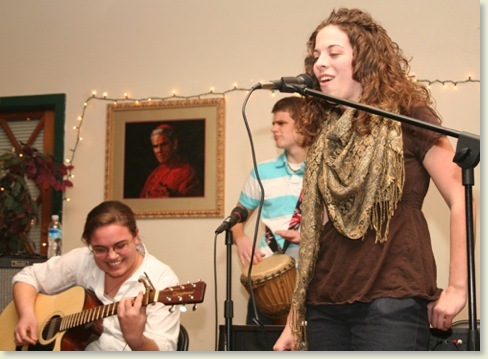 Friday night, Kilian’s Café was packed to the brim as students from all classes came to celebrate the feast of St. Joseph to the fullest - with good company and music. The lineup on Friday was talented and well-varied with performances from Pub Night veterans, such as Freshman Eric Maschue, Sophomore Matt Marchand—who as usual wowed the audience with his musical ability—and vocal powerhouse Meghan Rubin. There were also performances by Nick Freeman and the Texas Heat, as well as an unexpected performance by Seniors J.P. Minnick and Brian Gallagher at the end of the evening. The event, as usual was a great time to relax with friends and was a perfect way to end the feast—a wonderful respite in the middle of Lent. Marie Miller and Senior Shelagh Bolger played a set. The crowd loved Senior Anna Adams, Junior Catherine Briggs, and Freshman Dominic Ginski. Nick Freeman and the Texas Heat played some country music favorites. Monday night, about fifty students and faculty members filled the Chapel Crypt to hear the last talk of the series on Pope John Paul II. 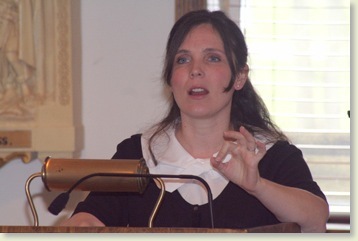 Prof. Mary Stanford spoke on John Paul II’s Theology of the Body, or as she pointed out, better termed Anthropology of Man. After a bit of background on the topic, she emphasized man’s relationship to one another in terms of giving each other as a gift. The giver first reaches out to form a relationship, and the receiver’s reaction shows what can happen. The receiver can either accept the gift, and a good relationship is formed, or they can reject the gift in which case a wounding is often consequential. The Christendom community was thrilled with this lecture series which enabled them to find out what makes John Paul the Great such an amazing Pope. Now that we have been in Rome for over a month, we are getting used to a couple of things, namely, passing St. Peter’s every day, having priceless works of art and architecture in front of our eyes all the time, and walking on historical ground almost wherever we go. 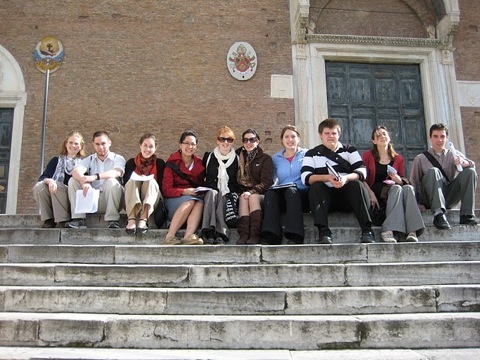 It is hard to believe that this time last year, a semester in Rome was just a hopeful dream for many of us. Now it is a reality. As usual, these past few weeks have been busy with classes, tours, and trying not to overdose on gelato. 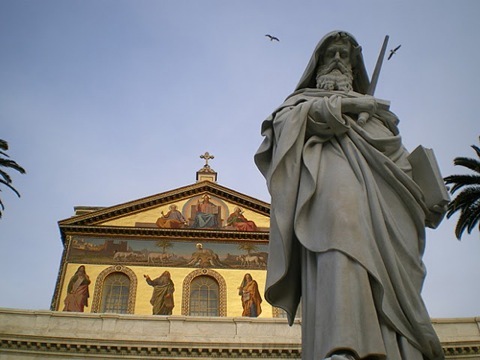 On March 12, the Christendom students were divided into three groups and led to view the very heart of St. Peter’s Basilica, the bones of the Fisherman himself. Our guide was a very lovely young woman from Hungary and she led us to a small, underground room where we were able to see the remains of St. Peter for ourselves. Although we were all fully aware that the bones of Peter were directly under the main altar, actually seeing them was a very moving experience. I unexpectedly found myself very near tears and it took an extra effort to finally leave the room and return to the surface. On our way up, we passed by many deceased Popes’ tombs, including Pius XII and John Paul II. Later on that week, not wishing to ignore the other major patron of Rome, we toured the amazing church of St. Paul Outside the Walls. Inside the giant building, long rays of light from the many windows shone on the tomb of St. Paul, the Apostle to the Gentiles. After we had all had prayed at the sacred spot, many of my classmates took the time to gaze at the amazing doors and giant statue of St. Paul on the outside of the church. 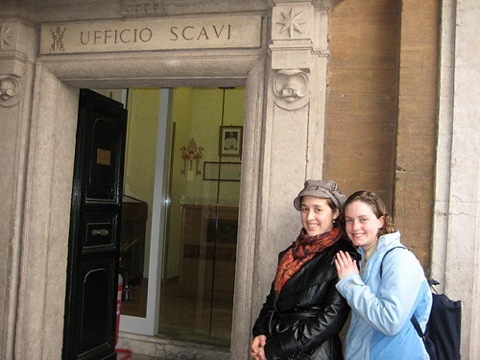 Although we were not able to join the Christendom campus in celebrating the traditional festivities of St. Patrick's Day, Mr. and Mrs. Fuerte and Beth Doherty took the time to make sure the venerated saint of Ireland was properly honored—even in Rome. 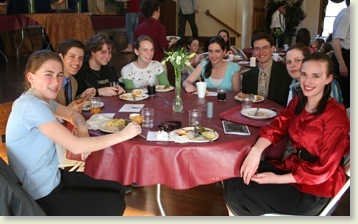 The Rome students found the usual weekly dinner transformed into a green feast, even the dessert. We also had a little dance afterwards, which was the icing on the cake to an enjoyable evening. All through this semester, my classmates and I have been struck by the patience and cheerfulness of our Rome directors and Residence Assistant. 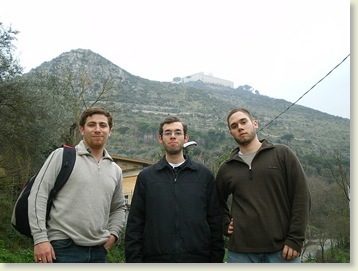 Christendom is very blessed to have such people in charge—another big plus to the Rome Semester. 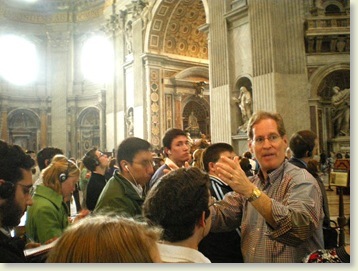 Now that lent is winding down, the Rome students look forward to Dr. O’Donnell’s annual visit [happening now] and the coming of Easter in the Eternal City. At the entrance to the Scavi. Another great shot by John Killackey: St. Paul Outside the Walls. 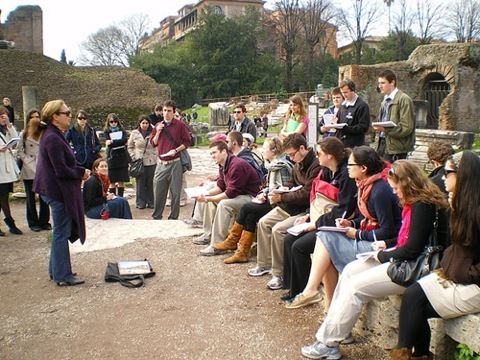 Discovering the riches of the Roman Forum. Last Wednesday, The Chronicler Online had the opportunity to interview president Dr. Timothy O'Donnell about the traditional celebration of Saint Patrick's Day at Christendom College, and his zeal for the feast day as well as the history and culture of the Irish people. 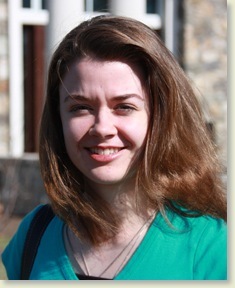 CO: How did the traditional St. Patrick’s Day celebration begin at Christendom College? 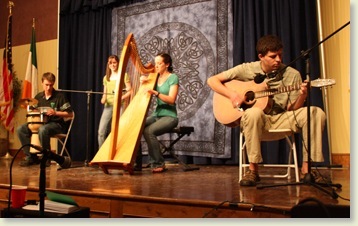 O'Donnell: The Irish culture has always been celebrated here at Christendom. The people who worked for Triumph magazine and the Christian Commonwealth, out of which the college grew, had a habit and tradition of singing Irish songs all the time—particularly the Clancy Brothers' songs. The founders, including Dr. Carroll—an Irish Catholic historian—Dr. Marshner, and Mr. O'Herron, knew all things Irish and readily participated in this tradition and so it was natural that things carried over. 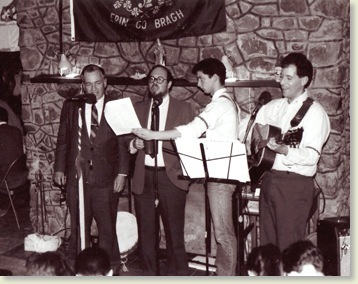 In 1985, the college held its first ever St. Patrick's Day celebration on campus, and it was a wonderful day of music, song, and poetry. In 1986, my wife, Cathy, and I got involved and it has continued ever since. Over the years it has become one of the most beloved annual traditions on campus. 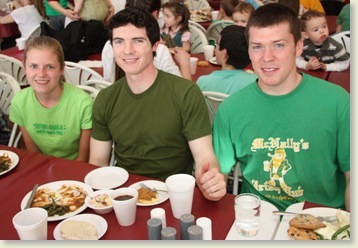 The St. Patrick’s Day events on campus reflect the true meaning of the day, which is affirming Catholic culture wherever it is found, whether it is by the Italians on the feast of St. Joseph, or by the Bavarian German culture at Oktoberfest. The Irish culture is something that should be appreciated, and it is a day on which St. Patrick should be truly honored and celebrated. 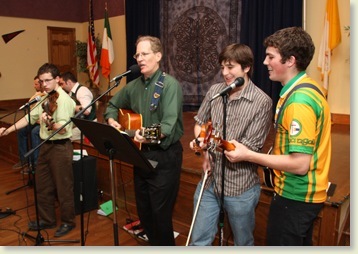 The music, dancing, and poetry of the Irish race and the affect that the Gospel has had on Irish culture and history should be—and is—celebrated here at Christendom College. CO: Has the celebration evolved from its original beginnings? O'Donnell: The celebration of St. Patrick's Day today has maintained much of the tradition and structure from when it started. 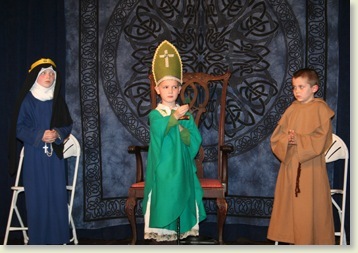 There has always been participation fromf the children, especially the three children dressed as St. Patrick, St. Bridget, and St. Columcille. 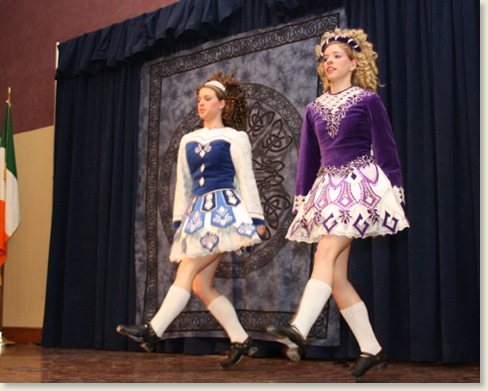 The Irish dancing in particular, has been a huge addition to the celebration, with the performances of both children and Christendom students. 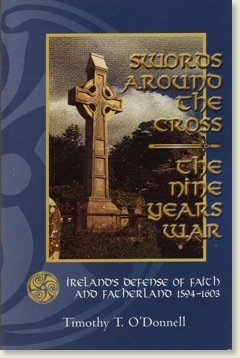 CO: What interests you about the history of Ireland, and how has it inspired you — especially to write your book about Irish history, Swords Around the Cross? O'Donnell: I grew up in an Irish Catholic family, and I remember reading a paperback book, "Red Hugh: The Fighting Prince of Donegal," in my grammar school library. It was the first time I had heard about Red Hugh O'Donnell, and it inspired me to read more about the history of Ireland. I learned that the Catholic faith is so formative in the history of the Irish people – it is really the history of a Catholic people who were often struggling, and discriminated against. I have written about the Nine Years War, a period in which the Northern clans rose up against Queen Elizabeth, who was trying to establish Protestantism within Ireland, though at that time the country was close to 98% Catholic. Heroic clansman, primarily the O'Donnells, McGuires, and O’Neills rose up with other clans and fought against overwhelming odds, a national movement which was significant in establishing the Catholic identity of a people who rebelled against Protestantism. Though they lost the war, the Catholic faith remained, though it faced persecutions, religious discrimination, and legislation, which outlawed the Sacrifice of the Mass and the Sacraments. The defense of the Catholic faith, and absolute centrality of the faith that you find in the Irish culture, is almost as we say at Christendom, "the air they breathe." Even the expressions, for example, the way you would say "Good morning" in Ireland was "God and Mary be with you." The faith penetrated the culture to such a depth. Sadly, this is no longer the case, as there is now a brutal secularization of Ireland, a current crisis which is incredibly sad. But by looking back on the beauty of the Irish past, especially the deep love for the Mass and devotion to the Catholic faith, we can reclaim that cultural identity in the present and build for the future of Ireland. CO: How is St. Patrick a model for Christendom Students? 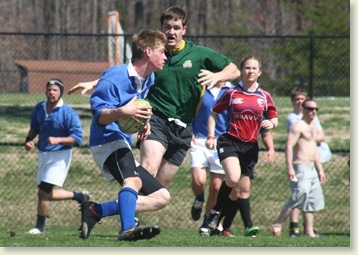 Rugby season was officially launched on Saturday with an awesome victory over George Mason University's B Team. The Crusaders thrilled the crowd with a convincing 31-19 victory. After practicing all throughout the winter, and putting in hard training this spring, the boys showed up ready for any game, and proved themselves against a physically imposing D-1 University club. 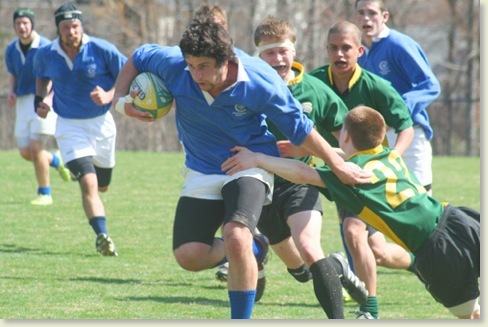 In the opening minutes George Mason scored on the team, but the Crusaders quickly recovered the ball, and, through some rapid offloads, Patty Norton was able to break through their defense and run it in for an answering try. From that point until the half, there were tries back and forth for each team, and it appeared to be anyone’s game. Senior Dave Long ran one in uncontested, and Rob Hambleton had a diving try along the sidelines. Coach McGuire kept the team fired up during half-time with a challenge to bury the opposition. The Crusaders came out in the second half with impressive scrumming from the forwards, and accurate passing from fly-half Joe Long. James Hannon scored on a breakthrough play, Ben Ranieri smashed through for another, and the boys closed out the game with the much deserved victory—one of the greatest victories in the long history of Christendom athletics. 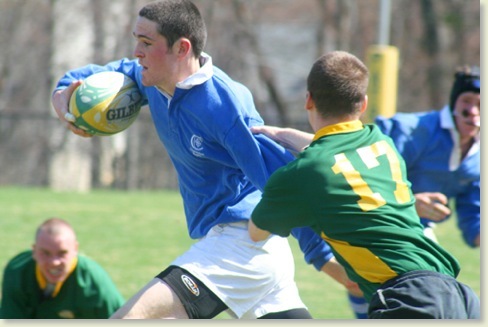 The Rugby team is off until April 10th when they head to Philadelphia to compete in a weekend tournament. Freshman Hugh Bratt forges through the GMU resistance. You can't stop Junior James Hannon the Canon. Ireland's Freshman Tommy Salmon leads the Crusaders down the field. 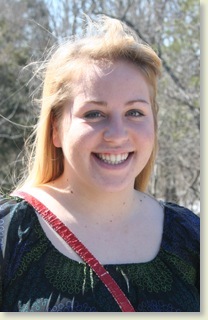 Q. I am thinking of going to grad school after I finish my undergraduate studies. What graduate programs do your students get accepted to, and what are some of the fields they study? Thanks! A. That is an excellent question, and it shows you are thinking ahead for the future. The first thing I should mention is that Christendom College is fully accredited and therefore, students should have no worries about having graduate schools accepting a degree from Christendom. Secondly, the broad liberal arts education that our students receive prepares them for any course of studies at the graduate level. In fact, some graduate programs, like medicine, are actually looking for liberal arts grads. In years past, students chose a college based on the availability of many specialized degree programs, believing that majoring in a specialized field would offer better career opportunities later on in life. But in recent years, studies have shown that it is more important for students to be broadly educated, rather than simply trained. These studies have found that, when one is too narrowly educated, it is more difficult to adapt successfully to today’s fast-paced and ever-changing business world. 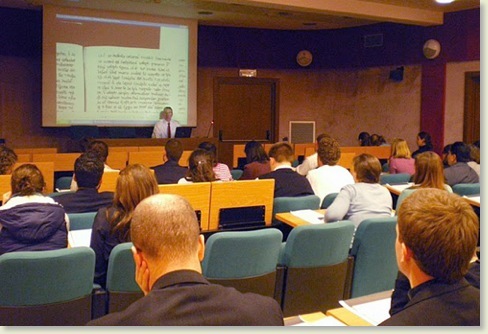 Christendom graduates have continued their studies at such prestigious schools as Notre Dame Law School, Harvard, University of Virginia, Fordham, William and Mary, The Catholic University of America, The Angelicum, The University of Dallas, Ave Maria School of Law, Virginia Tech, Oxford University, and others. They have earned MBAs, PhDs, JDs, MAs, and MDs. They have earned graduate degrees in Architecture, English, History, Philosophy, Business, Law, Medicine, Dentistry, Accounting, Electrical Engineering, Political Science, Nursing, Theology, Communications, Classics, and more. 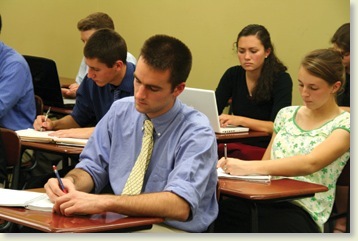 The Christendom education prepares you for all of these fields of study and prepares you well. I invite you to find out more. Thanks for asking and I hope this helps. Hobbies? I love to play sports. What's your favorite class? History with Mr. McGuire. He is so passionate about the material and it really rubs off on the students. His are the classes I look forward to the most. Do you play any sports? I play varsity basketball and baseball. 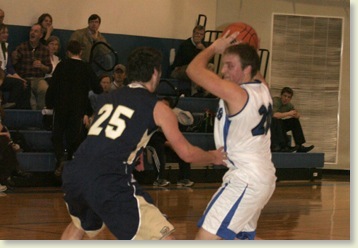 I play basketball because freshman year I wanted to try something new. In the past two seasons I have learned a lot thanks to Coach Vander Woude and my great teammates. I love baseball. I grew up playing it with my family. I'm thankful that I get to play this great sport at a college level now. Do you participate in any drama or music related activities? I don't. But I will sing along at Mass and in my room. What is your favorite thing about Christendom? My favorite thing is being around so many like-minded people who take their Faith seriously. I also am thankful for the friends I've made here, especially my roommates. Why did you choose Christendom? I chose it because I knew of the Catholic culture which flourishes here and I really wanted to be a part of it. What do you plan to do after graduation? After graduation I plan on going into the Marine Corps as an officer, if everything goes as planned. 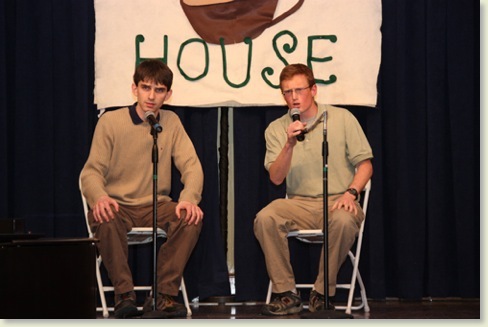 Friday night, tasty smells and melodious sounds filled the tightly packed Chester-Belloc Room of Regina Coeli Hall, as students took the stage and performed musical pieces in a café-style atmosphere. 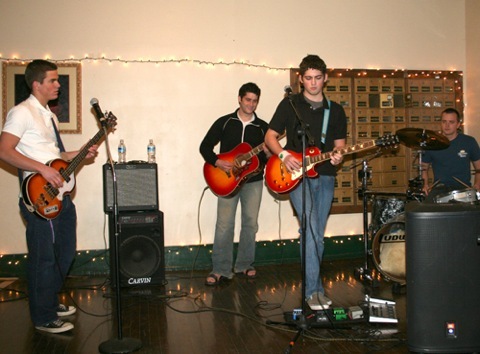 The SAC sponsored event started at eight o’clock with the band Starting Early, who played a set filled with classic Beach Boys and Beatles songs. 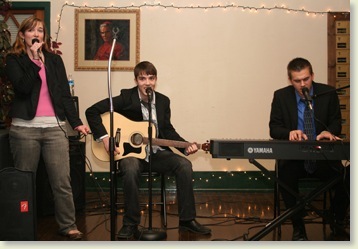 A new Christendom musical group, Applied Sciences, performed—comprised of talented pianist and vocalist, Transfer Matt La Fave, Guitarist and vocalist, Sophomore Philip O’Neil, and vocalist, the Chronicler Online’s own, Sophomore Liz Sartor. 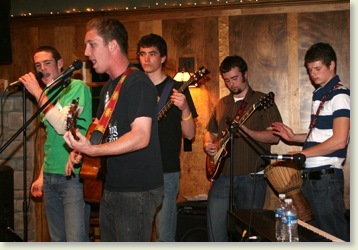 They performed a piece by Maroon Five, as well as “Wonderwall” by Oasis. 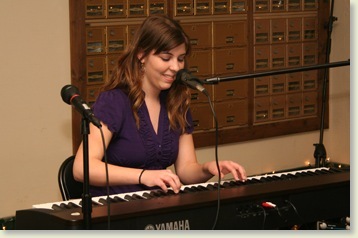 Many students went solo, and displayed their piano talent, like Freshman Colleen Harrington who played Switchfoot’s “Only Hope,” Sophomore David Frank, who played an original composition titled “The Waltz of the Scarlet Pimpernel,” and Freshman Jacinta Ferri, who played and sang a Colbie Callait song. 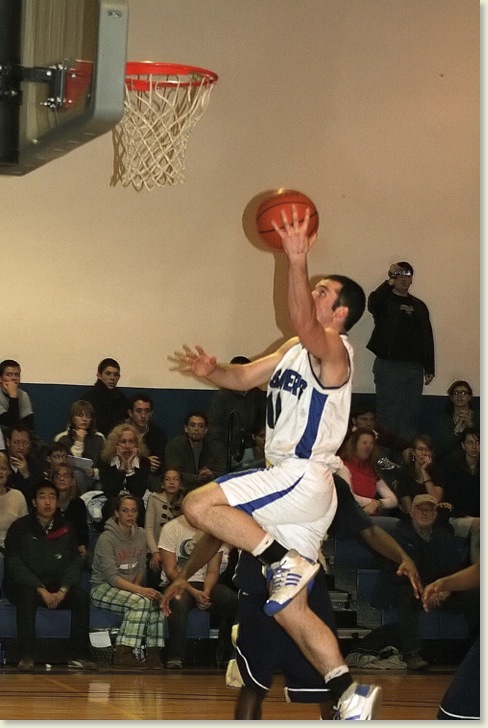 Sophomore P.J. Freeman closed the night with an intense classical violin performance. Everyone enjoyed the chance to chill and listen to music after a long week, and judging by the smiles on the audiences faces, everyone was quite pleased with the results. Starting Early performed "Don't Worry Baby" and "Wouldn't It Be Nice" by the Beach Boys. Sophomores Anna McShurley and Gabriel Schuberg opened up with a beautifully performed violin duet of Pachabel's Canon. Senior Anna Adams, Junior Catherine Briggs, and Freshman Dominic Ginski performed a few fun upbeat songs. 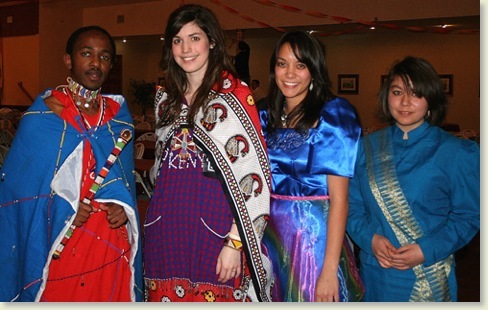 On Saturday night, students gathered in St. Lawrence Commons during dinner for “Cultural Heritage Night,” a showcase of the food, traditions and talents which celebrated the diverse cultural backgrounds of Christendom Students. The kitchen staff prepared a delicious meal, featuring several choices in keeping with the multi-cultural theme. In addition to the regular fare, there were a number of dishes prepared by students who had special recipes from their respective ethnic backgrounds. After the meal was finished, there were a number of presentations by students willing to share their unique talents and some interesting information about their culture. 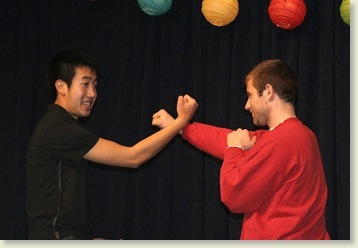 Senior Alan Ng demonstrated Chinese martial arts with agility and skill. 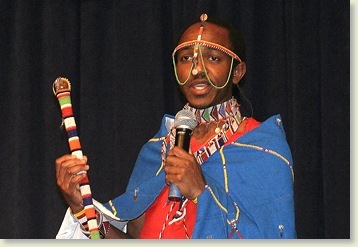 Sophomores Paul Nangurai and Leah Merrill showcased the colorful dress of Kenya, beautifully adorned with many beads, and accessorized with bright beaded jewelry and headdress. Paul also shared some of his country’s traditions and customs. 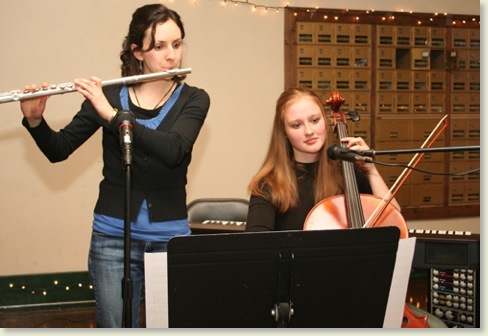 Freshmen Taylor Anderson and Sarah Halbur played a lively Norwegian folk tune together on their violins. Chris Foeckler and Brian Killackey, both sophomores, performed a very impressive and energy filled Irish step dance, representing the Irish heritage they share in common with many of their fellow Christendom students. 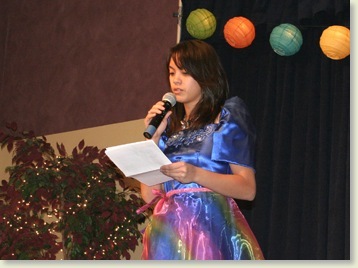 Last but not least, senior Krystal Schuetz, who organized the event, made her appearance dressed in traditional Filipino attire and read the poem “To the Philippines” by the national hero Jose Rizal. The Christendom College community boasts international students from Canada, Colombia, Japan, England, Ireland, Mexico, and Kenya. Paul, Leah, and Krystle are joined by Senior Jenny Dhanagom showcasing their traditional garments. 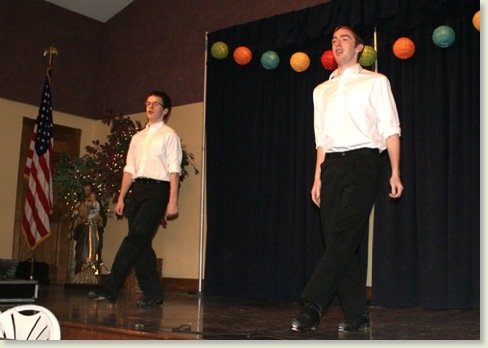 Sophomores Brian Killackey and Chris Foeckler put on an impressive Irish dancing show. 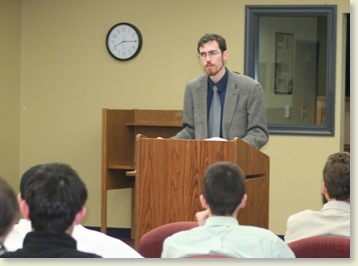 On Thursday night, students gathered in the basement of St. John the Evangelist Library as Classics professor, Mr. Andrew Hayes, presented a lecture entitled “Pope Benedict and Islam.” The talk primarily focused on the Pope's understanding of modern Islam, and included much information about the history and relationship of Islam and the Papacy. The talk further compared the stances on the Islamic religion as spoken on by Pope John Paul II and Pope Benedict XVI. 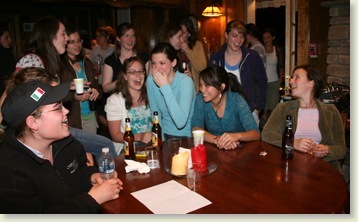 Following the lecture, students enjoyed light refreshments and drinks. This talk will be available for download at Christendom on iTunes U. 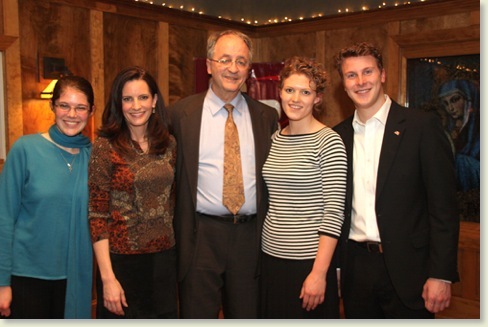 On March 1, FOX News Commentator Kate Obenshain and Virginia State Delegate Bob Marshall addressed students in St. Kilian's Café. The event, hosted by the College Republicans, is the first in a series of Coffee Socials that provide students with an informal setting to meet great conservative leaders and exchange ideas. 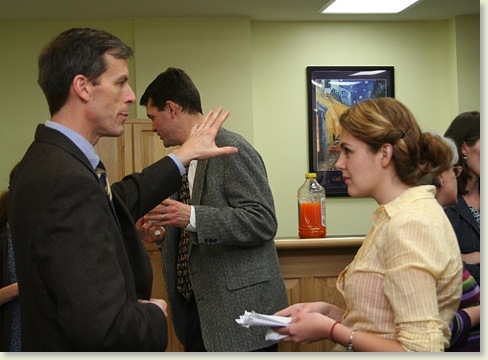 Obenshain, the Vice President of Young America's Foundation, encouraged students to be active in the political sphere. Obenshain remarked that truly conservative colleges like Christendom were a rarity and was enthused by what she experienced on campus. 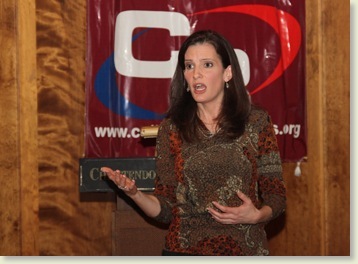 She encouraged students to run for office, citing a need for good conservative men and women, now more than ever. Delegate Bob Marshall (R), representing Virginia's 13th District since 1991, then addressed students and reinforced Obenshain's charge to be active in politics while sharing a number of personal experiences in politics. Senior Chris Dayton, who helped organize the event, said that he and his peers found the talks to be inspiring. “People came up to me and were saying that the talks had really got them thinking and made them see that they really could make a difference,” he said. Students at Christendom are active in the College Republicans as well as other conservative and pro-life organizations throughout the year. The Young America's Foundation has just announced that it will once again be ranking Christendom as one of the Top Ten Conservative Colleges in the nation. Read more about this event here. 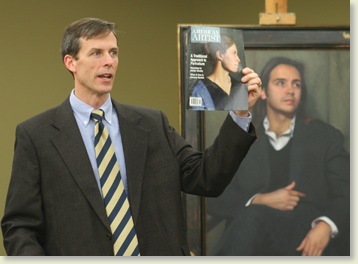 Both Obenshain's and Marshall's addresses can be heard at Christendom on iTunes U. College Republican Leaders Freshman Kelly Lawyer and Seniors Elizabeth Whittaker and Chris Dayton pose with Obenshain and Marshall. Once our Italian Immersion week was finished, we started our normal class schedule in Rome, which consists of Roman Perspectives, Art and Architecture, Apologetics, and of course, Italian. 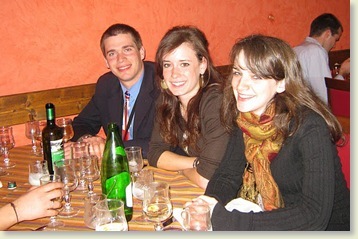 On the side, the Christendom students have happily been educating themselves in an intensive study of the coffee, pasta, and wine of Italy. We found that as long as the local twenty-four hour bakery continues to stay in business, we all will be fine this semester. We all greatly enjoyed our first free weekend, which ended this past Sunday night. Our Residence Assistant, Beth Doherty, helped us kick it off by helping arrange an outing to the ballet, Jazelle. This event was a huge success, and I suspect half the excitement, for the girls at least, was having a good excuse to dress up. I spent my free weekend exploring Rome on my own, simply packing a lunch and tramping off in a random direction. I explored some souvenir shops and churches, tried out a new coffee shop, and wandered through a mosaic art gallery. My highlight was finding a bookshop with an English section, where I happily read until I was politely kicked out for closing time. Meanwhile, the rest of my classmates scattered to different sites and places throughout Italy. 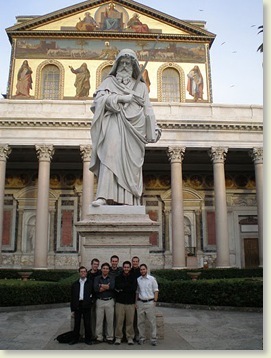 A group of the boys spent an entire day at Monte Cassino, the amazing site of St. Benedict's monastery and tomb. 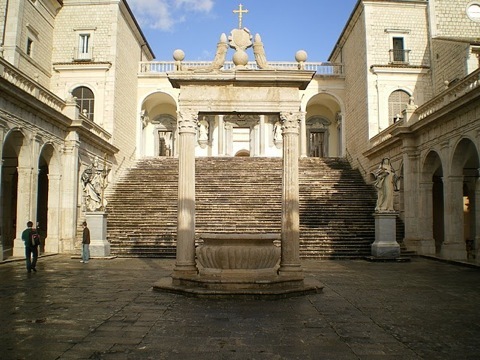 Two students went to Nettuno, the town and shrine of Saint Maria Goretti, while others went to a local mushroom festival, the Spanish Steps, and the Trevi Fountain. Rome Program Director Mr. Fuerte also took a group of adventurous students to Saturday’s big rugby game, featuring Italy versus Scotland. From the gathered reports, the game was very loud, very competitive, and tons of fun to watch. On Sunday, many of the girls joined Mrs. Fuerte for a day retreat offered at a nearby convent. It was a chance to spend some time in prayer and reflection in a very peaceful atmosphere. The nuns could not have been sweeter and served us a delicious lunch afterwards. 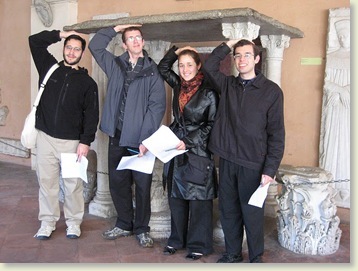 Other students opted to go to the Vatican Museum, since it was the monthly free admittance day. The museum houses hundreds of paintings and pieces of classical art, but my classmates found out that you have to arrive very early in order to beat the immense crowd that flocks to the museum’s doors. Although free admission is always a plus, you also want to escape from being trampled or crushed to death by a tourist mob. Now after sharing our stories and adventures of the past weekend, my classmates and I realized that yes, we still have class on Monday, which means that reading has to be done and assignments finished. So we scatter to our respective rooms and study-nooks in order to accomplish what is expected of a college student. 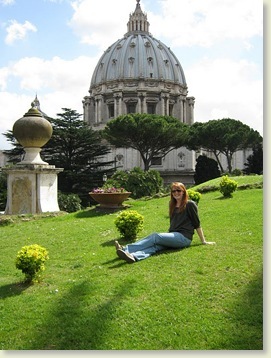 Resting in front of the Aracoeli on top of the Capitoline Hill. 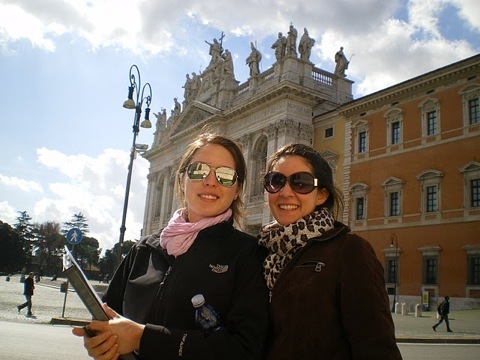 Jacquelyn Brogley and Noreen Daly enjoy the Italian sun and St. John Lateran. 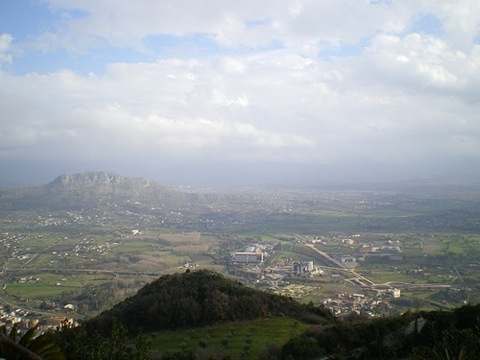 John Killackey snaps another great shot: a view from Monte Cassino. It was a glorious day to be at Monte Cassino. Taking notes on the go is something you become an expert at. At the start of the semester, new faces and personalities arrived on campus—the transfer students. 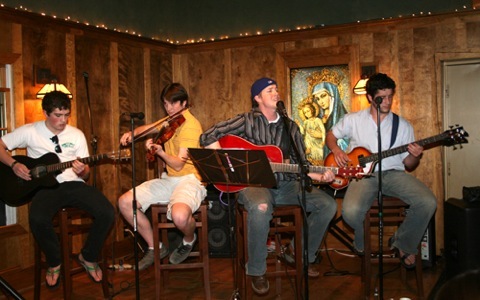 They are new to the Christendom College scene but veterans to the rigors of college life. Several made the transition from large secular universities, others from small private colleges. Freshmen Daniel Mitchell transferred from a large state university to Christendom. 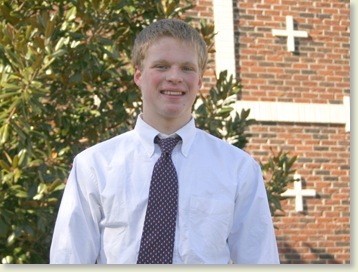 Mitchell said that he chose Christendom because it offers a great Catholic education and an enjoyable Catholic atmosphere. 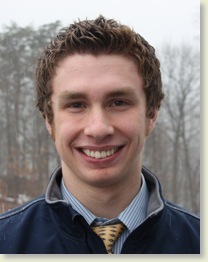 “My good friend John McWhirter, also a freshman, encouraged me to come. Everything he told me about the school was positive, which really impressed me,” he said. Transfer students are expected to complete the core curriculum classes including English, History, Philosophy and Theology, though many students are able to transfer their Language, Math, and Science credits from their previous colleges. For most of the transfer students, faith is a very important part of the their academic formation. Transfer students are eligible for all the same financial aid considerations as first-time freshmen, including academic scholarship, loans, and grants. A transfer student goes through the same application process as a first-time freshman but also must supply his/her college transcripts in order to receive credit. The men’s and women’s basketball teams finished the year off last week with games against Gallaudet University. 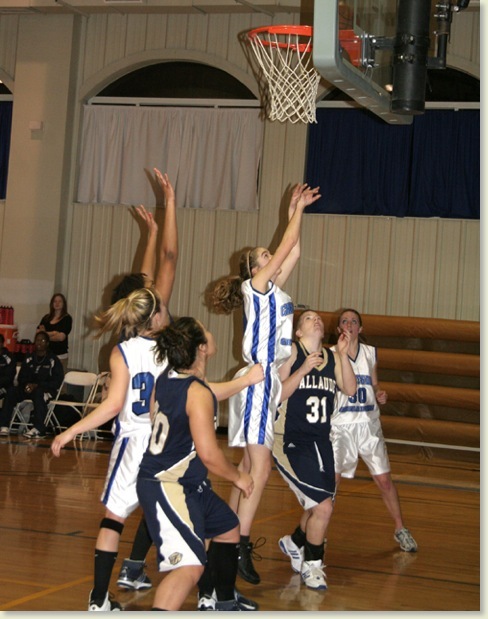 The game against Gallaudet played last Thursday, showcased “Senior Night” on the College campus. Both teams honored their departing seniors. For the Lady Crusaders Jeanie Goeckner and Meghan Kavanagh played their last game in Crusader gymnasium and for the men TJ Nacey, Matt Lancaster, and Matt Hadro finished off their careers. This year’s seniors mark a unique passing of the torch, so to speak, as they were freshmen when former Athletic Director Mr. Tom Vander Woude was in his final year at the college. 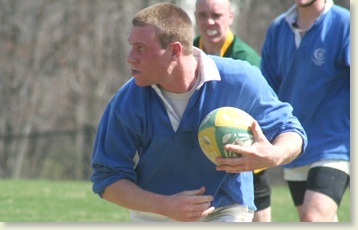 Matt Lancaster and Matt Hadro both remember playing for him with fond memories. 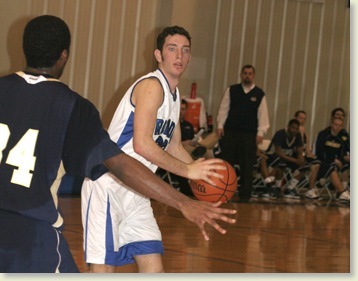 The games against Gallaudet featured a contrast in styles for both games. Gallaudet was a very talented team and looked to run the floor and play pressure defense while the Crusaders looked to try and control the tempo more and be more methodical on the offensive end. The Gallaudet women’s team raced out to an early lead and never looked back. The Lady Crusaders played solid defense and had some offensive bursts in the 2nd half but the Gallaudet team had too much too often as the Lady Crusaders fell to the Bison in the last game. The men’s game was a tale of two semesters as the first game back in November featured the Bison winning by a huge margin as the Crusaders were unable to deal with the pressure from Gallaudet and the score told the story. This game would be far different. Despite playing without juniors Matt Rensch and Joe Townsend, the Crusaders fought hard for 40 minutes, even leading the Bison during the first half. Gallaudet made a small run to end the half and led 36-31. The 2nd half saw the athletic Bison pull away, but the Crusaders fought back behind the strong play of Brian Fox and Brendan Krebs on the offensive end and Tim Beer and Sam McMahon on the defensive end. The Gallaudet team tried everything they had done in the previous meeting, but the progress made over the year by the Crusaders was evident, as they shredded the Gallaudet press multiple times for open shots. Despite the hard fight of the Crusaders, the Bison did pull away behind a game high 29 points for senior Johnny Jackson, the final score read Gallaudet 87 and Christendom 70. I would like to personally thank both teams for their hard work throughout the past season, and thank the fans for their support throughout the year as well, especially for senior night which included a packed house by the Christendom “Crazies,” as our fans are affectionately called. Both teams showed great improvement throughout the year and have lots of young talented players which only gives confidence and excitement for future years in the world of Crusader Basketball! You just can't stop Dave Townsend. Caitlin Morgan adds two to the Lady Crusader's score. 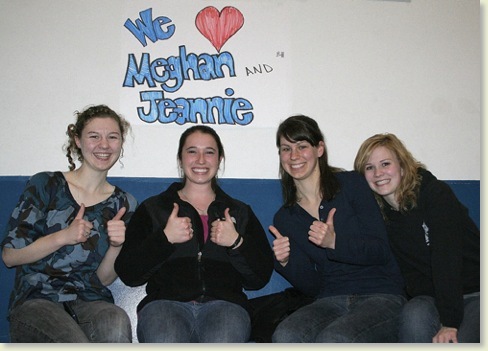 Sophomore Frances Dewey, and Seniors Sarah Miranda, Lindsey Mersch, and Marie Muys show their support for the seniors. Q. Can you tell me about the types of Masses offered at Christendom? Do you have different types of Masses for people to go to, like traditional Masses or contemporary music Masses? A. We do offer different types of Masses at Christendom, but I’d have to say that they are all offered in, what would be considered, a traditional manner. There are normally 15 Masses a week offered on our campus. Two or three a day, except for Sunday when there is one main community Mass offered. 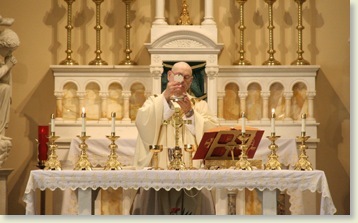 As far as the type of Mass goes, our priests offer the Ordinary Form of the Mass (sometimes referred to as the Novus Ordo Mass) in English and Latin and they offer the Extraordinary Form of the Mass (sometimes referred to as the Tridentine Mass) in Latin. The actual schedule may be found here. Generally, there is some type of hymn sung at the beginning of Mass and at the offertory. These songs are normally accompanied by our organist and are typically songs like, "Jesus My Lord, My God, My All," "Soul of My Savior," "Faith of Our Fathers," "Salve Regina," etc. 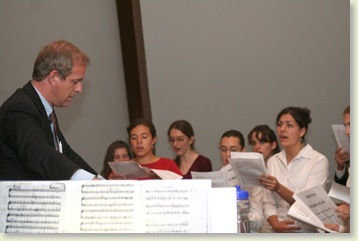 The various parts of the Mass, such as the Kyrie, Gloria, Sanctus, and Agnus Dei are also often sung, sometimes in Latin and sometimes in English. Gregorian Chant, offered by our Schola Gregoriana, is also commonly heard at a variety of the Masses throughout the week. On Sunday, we have one main community Mass at 10 am which is accompanied by our accomplished choir and the Schola Gregoriana. There is a lot of incense and solemnity, and about 6 or 7 altar boys, during this Mass and it is the highpoint of our week here. 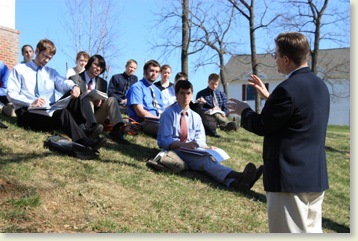 For some, the liturgical experience at Christendom is new to them because they grew up in parishes where the norm was to have more contemporary Masses and not as much incense, altar boys, patens, bells, chant, and sacred polyphony, but they grow to love the traditions of the Church through learning more about them and experiencing them on a daily basis. 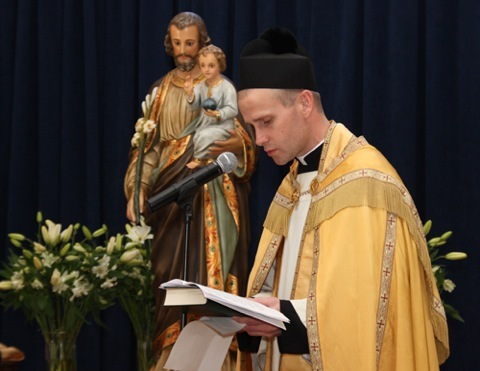 Others grew up with all of the so-called "Smells and Bells," and they too are happy to immerse themselves in the liturgies offered. I hope this helps and if you are ever in the area, please feel free to stop by for Mass and experience the beauty of the liturgy in our Chapel of Christ the King.